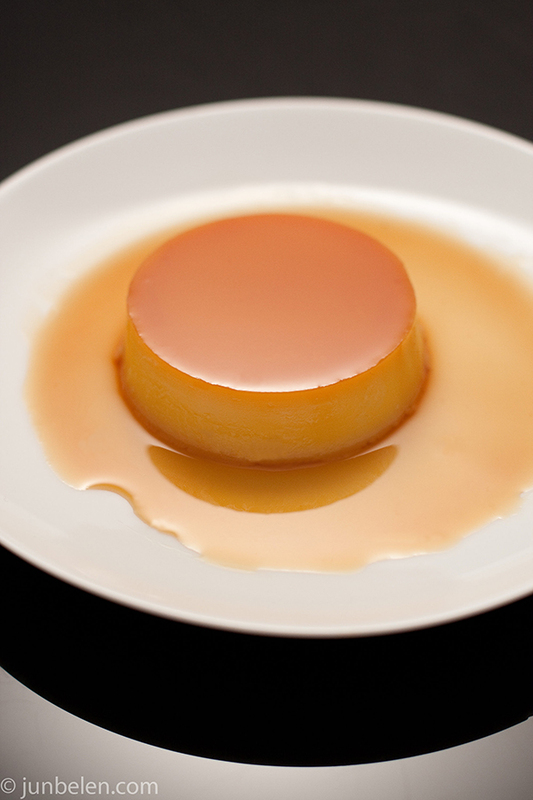 Aside from over-the-top telenovelas, Filipinos and Mexicans share the love of flan, that sweet, smooth caramel custard goodness. Filipinos call it leche flan, which is typically richer and denser than its Mexican counterpart. When I think of leche flan I think of Christmas. I think of holidays and birthdays. My mom makes leche flan only on select special occasions. But scorching hot summers come to mind as well. A big bowl of halo halo topped with ube and leche flan is perfect on a hot summer day. Leche flan is traditionally made using a llanera, an oval tin pan that is filled with a mixture of eggs and milk and steamed. Over the past weekend, I was in a frantic hunt for llaneras in the city. Manila Oriental Market doesn’t carry them. Sur La Table in the Ferry Building doesn’t carry them either, which was surprising. If I were in Manila, I knew exactly were to get these elusive tin pans, I told myself. But I wasn’t and so I opted to use my beautiful ramekins instead, the ones that aren’t fluted. I actually loved how a 6-ounce ramekin makes an individual serving of flan. This recipe makes around 6 to 8 servings. My mom’s recipe uses a dozen egg yolks. Everyone does flan differently. Using only yolks gives a denser and richer flan similar to tocino del cielo, another classic dessert. Adding whites makes the flan lighter. My mom uses both evaporated and condensed milk but whole milk can be used as well. Candied lime peels are a wonderful garnish for leche flan. In fact, lime zest is sometimes added to the custard mixture to give it that pleasant citrus aroma. In a small saucepan, mix sugar and water and stir until the sugar dissolves. Bring mixture to a boil using medium to high heat until the color of the mixture becomes golden brown. 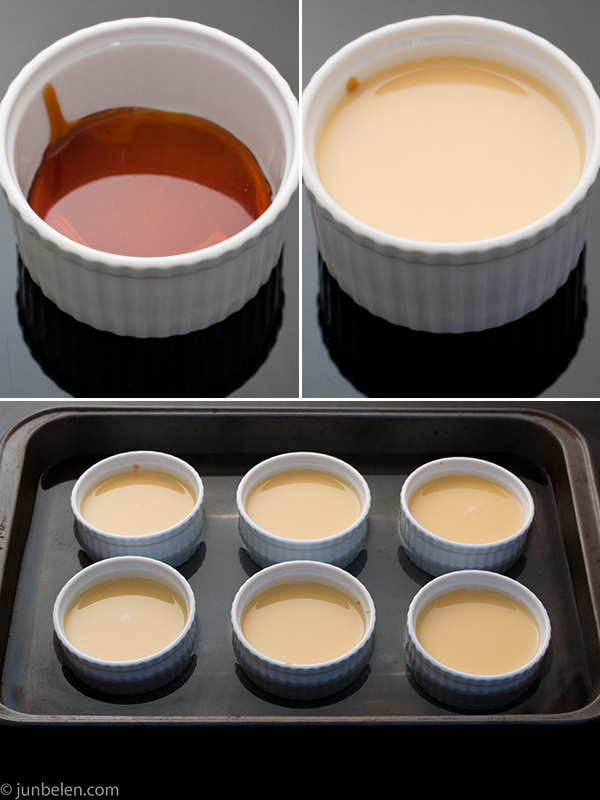 Carefully pour the hot caramel into the ramekins and swirl it around until it completely covers the bottom of the mold. Set aside to cool. In a large bowl, beat the yolks. Add the condensed milk, evaporated milk and vanilla extract until well blended. 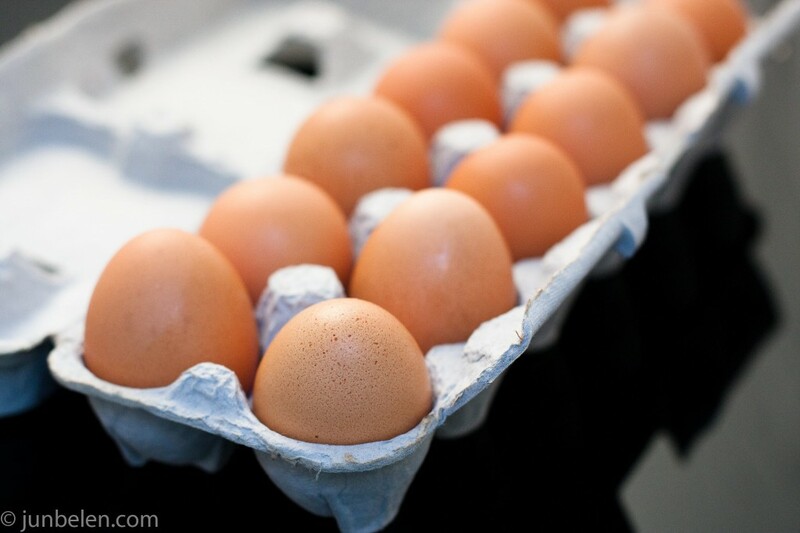 Using a fine strainer or cheesecloth, strain the egg-milk mixture to remove any egg solids. Straining the mixture is key to making a really smooth custard. Pour the mixture into the ramekins and cover tightly with aluminum foil. Bring a pot of water to a boil. Place the ramekins in a roasting pan. Add hot water until it reaches half-way up the sides of the ramekins. Cook for 40 to 50 minutes until the flan is firm. Let the ramekins cool and then let them chill in the refrigerator. The best way to remove the peels from limes and other citrus fruits is to use a peeler. Carefully remove any thick white pith from the lime peel using a paring knife. Bring a medium pot of water to a boil over high heat. Prepare a bowl of ice-water bath. Blanch the lime peels for one minute. Using a slotted spoon, transfer the lime peels to the ice-water bath to cool. Repeat the process another time. In a small saucepan, mix sugar and water, heat over medium-high heat and stir until the sugar dissolves. Drain the lime peels and add them to the saucepan. Stir the lime peels while cooking until they become translucent, around ten minutes. Using a slotted spoon, transfer lime peels to a wire rack set over parchment paper to drain and let them dry overnight. The next day toss the strips of candied peel with granulated sugar in a mixing bowl. Separate any strips that stick together. Store in an airtight container in the refrigerator. Run a knife or spatula around the flan. Turn the ramekin upside down and carefully pat the flan down on to a serving plate. Garnish with candied lime peels. Jun, wow. I woke up to this post and wanted flan for BREAKFAST. Before Word Cup 2010 opening game started. You’re up early. I’m going to try your (mom’s) recipe. My usual is 8 yolks to the same condensed/evaporated milk ratio. Time to try another yummy treat! Thanks for sharing. Oh, and I like individual servings also. Sosyal! Thank you, Annapet! It’s definitely a very rich leche flan. Very sweet. The ramekins are really perfect for individual servings! Just curious, have you seen any place in the Bay Area that sells those llaneras? WOW, I was surprised to see this featured on David Lebovitz’s page. Congratulations! I love leche flan, so this is a must do. Thanks for sharing the recipe! Thank you for checking out my blog, Eden. I was pleasantly surprised as well. David’s a genius! let’s go pihoy food ambassadors let’s go! Hi Jun – Your photos are wonderful! I have 2 llaneras that belonged to my lola who passed them on to my aunt who passed them on to me together with her recipe for leche flan. They are a little more than 3″ deep. On a recent trip to Manila all I found were shallow ones (2 “). Do you know where I can get deeper ones ? Thanks Jo for stopping by. Your hand-me-down llaneras are actually very cool! So many memories in those tin pans for sure. Unfortunately, I do not know where to get llaneras here in the Bay Area. I’ve tried a Philippine grocery store and the fabulous Sur La Table but they both didn’t carry them. But I’m determined to find them some way. If I do, I’ll definitely let you know!! Thank you and hope you stop by my blog again! A lot of egg yolks used there! Yummm. Thanks, Vivienne. I know – 12 yolks may sound too much — but that makes the flan so rich. And so good! Hi Jun, these are the most beautiful and perfect pics of leche flan I’ve seen. I’m almost positive there are llaneras at the Asian market that opened near Callan Blvd in San Bruno. They’re of the typical shoddy quality of thin aluminum and possible leaks. Thank you, mark. I’d have to check out that store in San Bruno and will let you know if they have them!! Thanks again for the tip! Deliciousness!!! I’m drooling!!! Btw…can I sub. evaporated milk with regular 2% milk? Thank you, Adelina. I’m afraid the flan will not get the right thick custard consistency if you substitute 2% (or even whole) milk. I’ve seen people make flan with whole milk and with whole eggs (yolk + whites) and the flan becomes lighter and not as dense and rich. You have the best leche flan photos I have ever seen! Gah, I can’t believe I didn’t get to reply on this! My apologies! I found flaneras/llaneras at Manila Oriental Market, though I love love making flan using ramekins! Hi Maxine, the recipe makes around six 3-1/2-inch ramekin servings. In case you have those metal containers the recipe makes one 6-inch llanera. Do you steam or bake your leche flan? Charisse, I bake my leche flan in a 350 degree oven using a water bath. Joey, the recipe calls for one 14-ounce can condensed milk and one 12-ounce can evaporated milk. Hi Jun, i just wonder, if you’re baking leche flan, don’t you have to cover it with foil or something? No need to cover it with foil. Since it is cooked in a water batch, the custard is cooked slowly and gently. is that really how your flan looks like cause i have tried flan all over in california, mexico, chicago and michigan and i have never seen a flan like that they usually have a really unpleasent texture and they are overcooked thanks for the recipe im going to be trying this recipe tmrw at work since i work at a mexican restaurant maybe he will give me a raise lol. hi jun! 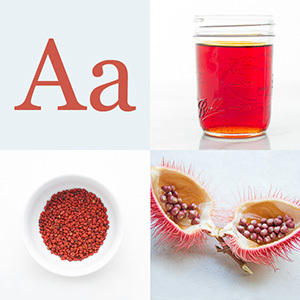 your blog is by far the most appetizing, most informative food blog i’ve read. how i wish i can send you llaneras but your ramekins are just perfect for this dessert. you just don’t make me drool with these recipes but you “feed” my eyes more of these beautiful pictures. Migby, thank you for the very kind words. I hope you’ll stop by the blog every so often to see what’s new. Thank you. Just made this and the flan turned out wonderful and rich, but I cannot figure how to get the caramel out of the bottom. It is possible I did something wrong, but there was no way to cut around the base of the ramekin to get the caramel out.